It’s Wardrobe Wednesday and since I’m on a clothing no-spend lock down, the next few weeks will be full of mix and match style. 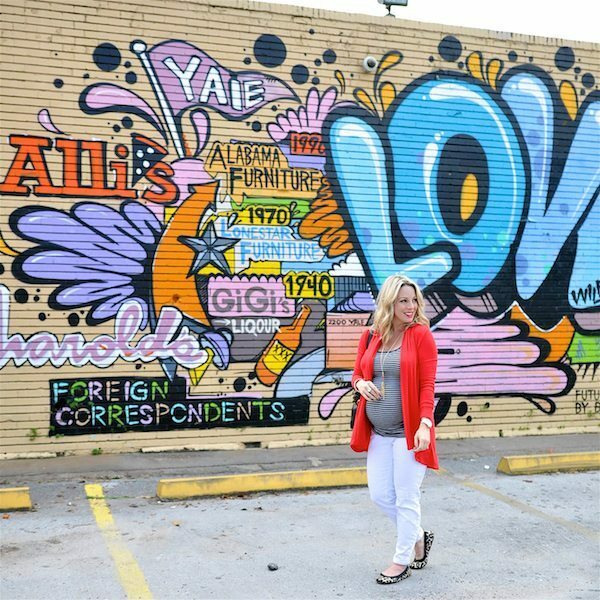 It’s going well so far with just one more month of maternity style posts! Some of you must be getting tired of these by now, since I know the majority of you aren’t expecting and might have a hard time relating to these big baby belly fashion posts! 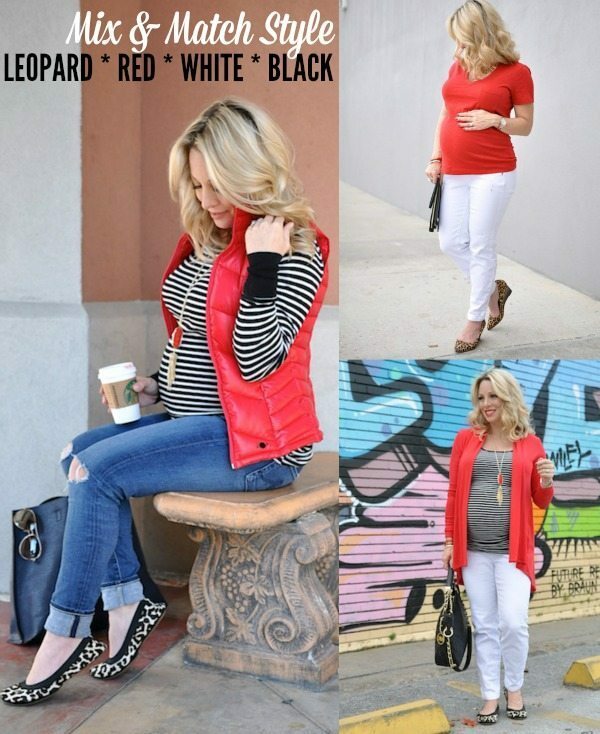 For you, I’ve included non-maternity options (this black & white striped long sleeve top is a dead ringer for the maternity version (probably one of my favorite maternity shirts I own) and the red v-neck tee is already non-maternity, I just sized up. But, if you happen to be pregnant, I’m so happy for you! #bighugs! and I hope to provide some fashion inspiration for your growing bump. 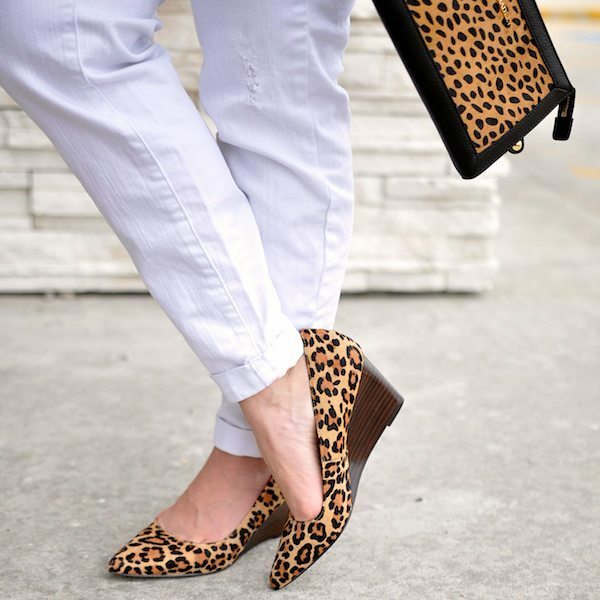 I’ve got this leopard, red, white, and black combo mixed and matched lately and kept the leopard in small doses with just a clutch or shoes. A little bit of leopard goes a long way! 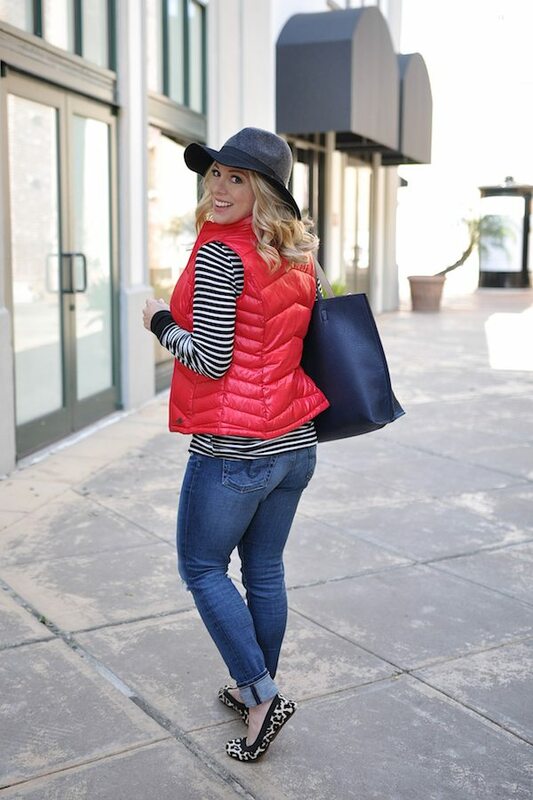 I’m typically a neutral-loving girl, but adding a pop of red in a shirt, vest, cardi, or accessories gives an outfit more vibrancy. If you need a good red lipstick, MAC Brave Red is a perfect true red and add a dot of sheer gloss in the middle of your lips to up the pout factor. I’m running low on things that actually fit comfortably, so this black and white striped top is in heavy rotation and the leopard flats are getting quite a bit of use! I’ve had them for a long time, but I’ve never worn them so much until now. I think even post-pregnancy, I’ll continue running around in them because I’ve grown to really appreciate how comfy and easy to wear they are. I’m officially 36 weeks now and even though I’ve felt really good up until about week 30, this last month is for sure the hardest. But, we’re in the home stretch now and I’m getting full of those feelings where you are just so ready to meet and hold your little baby! Although white jeans are typically seen more in the Spring or Summer, I’m making use of mine now, especially since I have a pair that fits. And our weather is funky, one day chilly and windy, the next day sunny and warm! This white jeans/t-shirt combo will be seen again in a few months, but with sandals, instead of leopard wedges. On a cool day, this jean jacket would be cute to add. I’m pretty particular about my t-shirts, and I want them soft and nicely fitted, not too baggy and not too tight. The Halogen jersey v-neck tee is a favorite and these colors are on sale for under $20. But, this Madewell tee is also really good with a perfect v-neck, not too low or high cut, and I’m crazy over this bright red. It also comes in 10 other colors and is under $20! This necklace was in one of my first Rocksbox sets (get your 1st month free with code HONEYWEREHOMEXOXO). It’s called the Slate Golden Flair necklace, but I can’t find it online. This one is similar and inexpensive. You may have already seen outfit #3 on Friday’s Weekend Steals & Deals, so I’ll just give a brief recap here. I kept my white jeans and striped top, but just added a cardigan instead and switched out the leopard shoes for the ballet flats. A change of bag also makes the outfit a little different. Have a great hump day! Halfway to Valentine’s Day weekend! Love this mix and match. 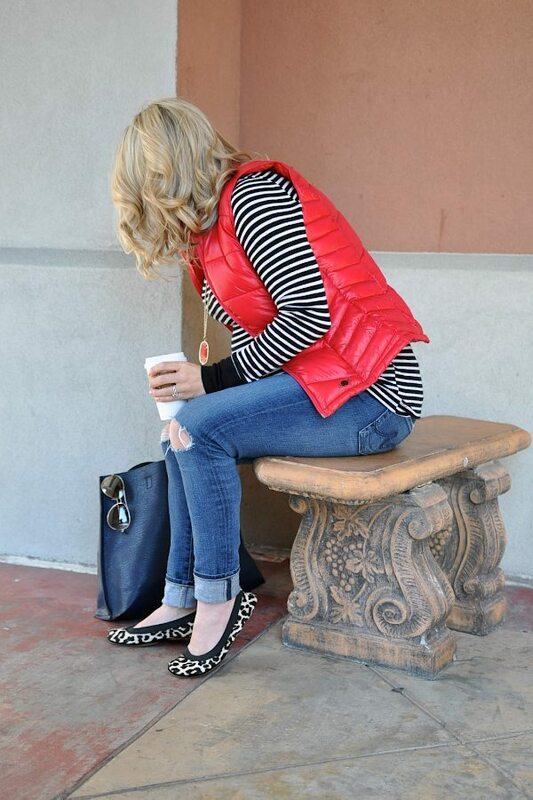 Loving the leopard paired with a touch of red. And, I am thinking I need to purchase and black and white stripe shirt (have short sleeve, but need a long). Hope you are feeling better! Love the flats! You need to stick to flats. You look so much better in flats! Flats, flats, flats! In conclusion, flats. I have a sick one over here, too. Sending good thoughts. Have always loved you in red. So good.